“Oliaigua” with figs | Jover Pons S.L. Cut all the vegetables in small pieces. Put oil in a cassola or soup pot and saute the vegetables. When ready add water. It’s important to cook over at low heat (do not allow to boil). When it is about to boil, remove from heat and it will be ready to serve. 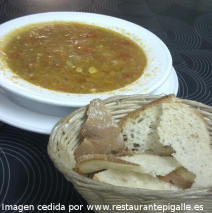 Place bread slices at the bottom of each soup dish; then ladle the hot soup (oliaigua) over it. This dish is accompanied with figs. Formerly, it used to be accompanied with French fries.